10-pound solid block ice made with filtered water by Culligan. 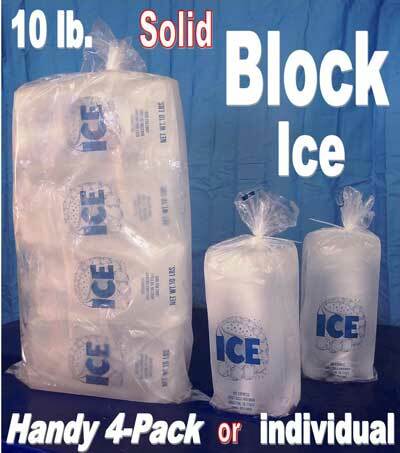 Our 10-pound blocks of solid ice OUTLAST regular ice for water coolers and ice chests. Block ice melts slower than crushed ice because it has less surface area per amount of volume. If you want ice to last and don’t care how fast it cools your can drinks, then go with the block ice. If you want to get serious about it you could always get some dry ice. Ice Express offers delivery for our 10-pound ice blocks, please call 713-941-7733 for details or click here to request more information. Don’t forget that in an emergency you can always send someone to 8257 Gulf Freeway, Houston, Texas 77017 and we will load your dry ice and accept your previously established credit or cash and you won’t even have to get out of your car.